Questions About Harvesting Summer Squash? When harvesting summer squash, the size of the squash is the best indicator that your crop is ready to be picked. If you wait too long and the squash get too big, the seeds will be large, tough and hard to eat and the flesh won't be quite as tender. Large summer squash are still edible and taste almost as good as young squash. But because of the texture of the flesh and seeds, more mature squash are less desirable. If you continue harvesting summer squash while they are still young, the plant will continue to produce more fruit. It's not uncommon to harvest varieties of summer squash several times a week to keep up with the plant's production levels. 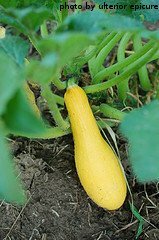 Some varieties of straightneck and crookneck squash can grow a few inches overnight. Straightneck and crookneck varieties of summer squash are usually harvested when they reach 4-6 inches in length. If you harvest them before they reach this size, there won't be much flesh to eat. If you wait longer, the flesh and seeds become tough. If you are planning to stuff the summer squash and roast it in the oven, you can wait until the squash are slightly larger as you will be removing the seeds anyway. Scallop/Patty Pan varieties of summer squash are usually harvested when they reach 3-4 inches in diameter. If you harvest them when they are smaller than 3-4 inches, they are hard to slice. If you wait until the squash are 5-6 inches in diameter, the seeds will be large and unappetizing to many folks. When harvesting summer squash, use a knife or shears to cut the squash from the vine. Never tug or twist on a summer squash as you may inadvertently pull the whole plant out of the ground. You could also damage the root system and distress the plant. It's best to leave about 1 inch of stem when picking squash. Summer squash is best eaten within a few days of being harvested. Because they have a high water content, they don't store well. 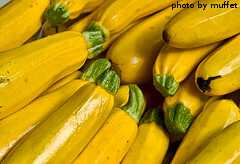 Most summer squash varieties will keep up to 5 days in a refrigerator. If you have a large crop and have no other options, it's possible to freeze extra summer squash. You can wash them, slice them and store them in an airtight bag in the freezer for 2-3 months. You can also blanch the sliced squash in boiling water for 2 minutes and then plunge it into an ice bath for 2 minutes before freezing it. The squash will last up to 6 months using this method. Keep in mind when freezing summer squash that the quality will suffer. The texture will be slightly limp and mushy and the flavor will be muted. Summer squash can all be pickled, much like cucumbers. We've never tried it ourselves, but we've heard that pickled summer squash will lose it's crispness in the process and end up mushy. 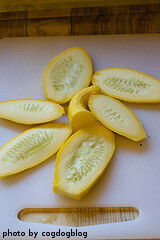 Summer squash can be dried using a food dehydrator. However, when it's re-hydrated, it tends to be soggy. In recent years, the FDA has recommended that summer squash NOT be canned due to high risks of bacterial contamination. One of the best ways to use extra summer squash is to give it away to friends and neighbors. We hope that you have a bumper crop of squash! Now that you've begun harvesting summer squash, it's time for some recipe ideas.